Fewer still, are the memories that don’t have anything to do with baseball. One such memory is with my childhood friend David. I went with his family up into the mountains, and we went wading into the crystal clear water of a brook/river of some sort. I remember the excitement of finding neat & interesting rocks to collect. There was no thought of book value for the rocks. No concern of rival bidders trying to go for the rock that I liked. No wondering if the rocks were gradable, counterfeit or altered in any way. Just me and my friend, searching for neat looking rocks for our collections. I have been fortunate to pick up several new cards for my collection recently. Some have been of the main-stream higher dollar variety, but I’m going to focus on the pickups that I’ve acquired which are much more obscure. Variations / errors / odd balls that you won’t find in Beckett. Yes, variations that are not checklisted. 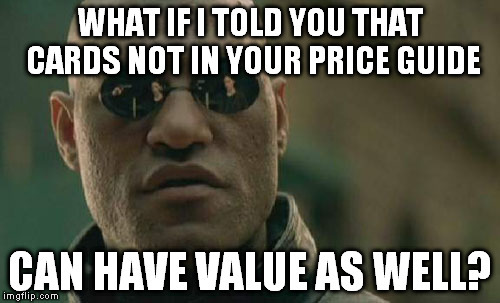 Allow me to invite you into a world where checklisted cards are not the only cards of value. Enter: The Cardboard Matrix …. Or what about the ’93 finest Nolan Ryan promo? Yes, these are the exception, not the rule, as the vast majority of this stuff goes for peanuts, but my point is that the collector of 2015 has come a very long way in terms of placing value on cards. Gone are the days of collectors saying “If it isn’t in the price guide, it doesn’t have value.” But enough about other people’s cards. Let’s talk about my latest additions, shall we? First, I grabbed the pink number version. This is about as borderline as you’ll see in my collection in terms of the “c’mon…is this *really* a variation?” question. I have it primarily because it is known by other 1991 Topps collectors as a legit variation. Second, I was able to grab a bold 40th logo back version. 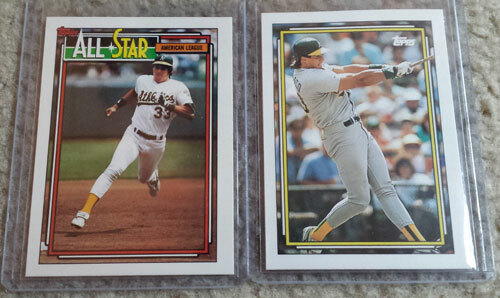 As for the glow cards, I picked up a smattering of 1991 Topps regular and all-stars. 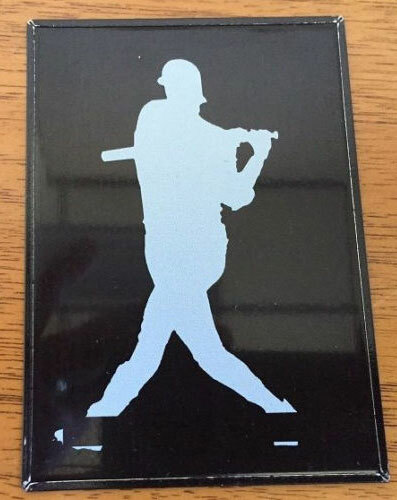 I was able to find the light back glow, dark back glow and no glow for the All Star. 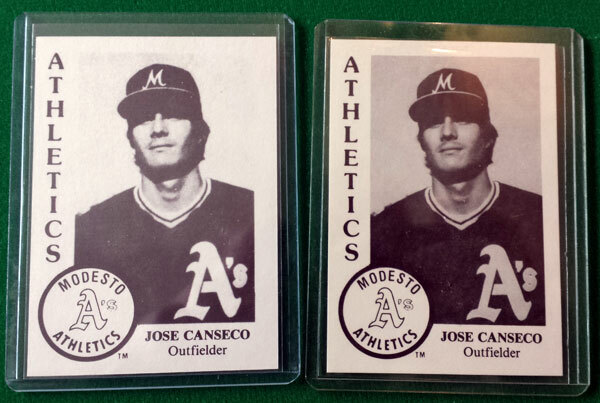 I also was able to get those for the regular Canseco … well … except for the no glow. Then, jacksoncoupage stepped in and said he had one. He mentioned he’d send it to me, so that should be coming in soon – thanks!!! It is a blank back, the cards are normal size and on 1991 Topps card stock. I don’t know if I’ve ever seen a blank back 1991 Topps card before, so I had to pounce on this. 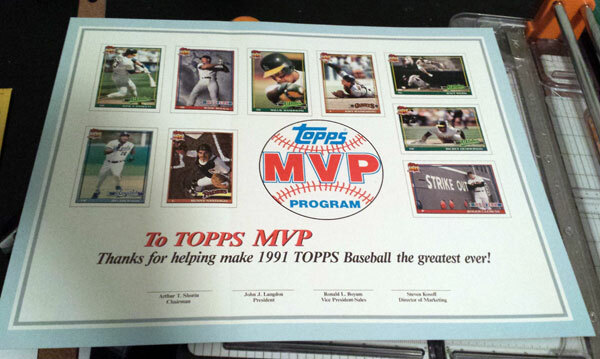 Apparently it was a promo sheet only given to people in the “MVP Program”. 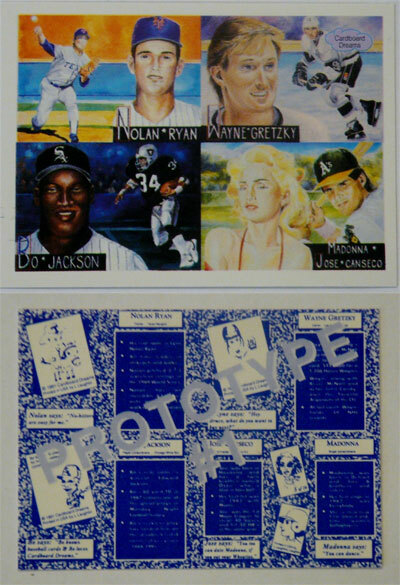 As I wrote about previously, the regular 1991 Topps cards had about 4 million of each produced. How many of these sheets were produced? 10? 100? 1,000? 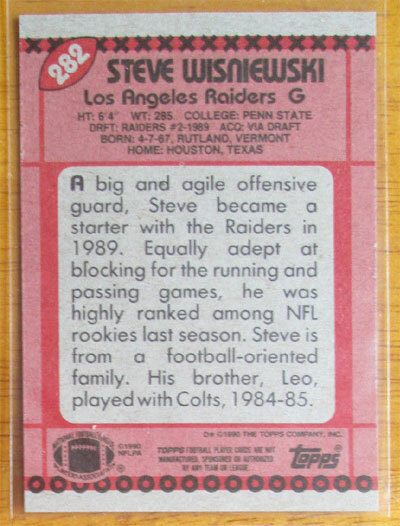 A while back, I saw some 1991 Topps baseball cards with football backs. 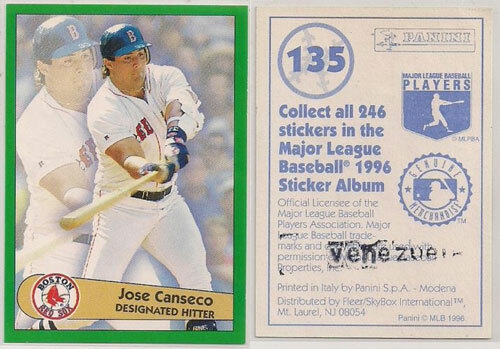 I thought that would have been a cool item to have if a Canseco ever popped up. Well, I tracked down a 1991 Topps All Star Canseco with a football back. Now I need the regular front version if that exists! 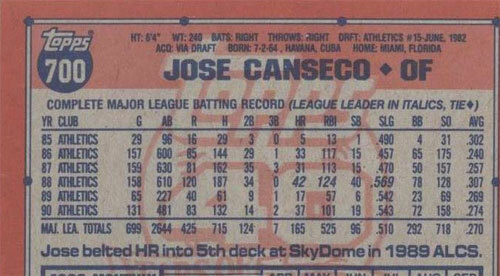 I also picked up a 1991 Topps cracker jack 4 in 1 card w/Canseco on it. 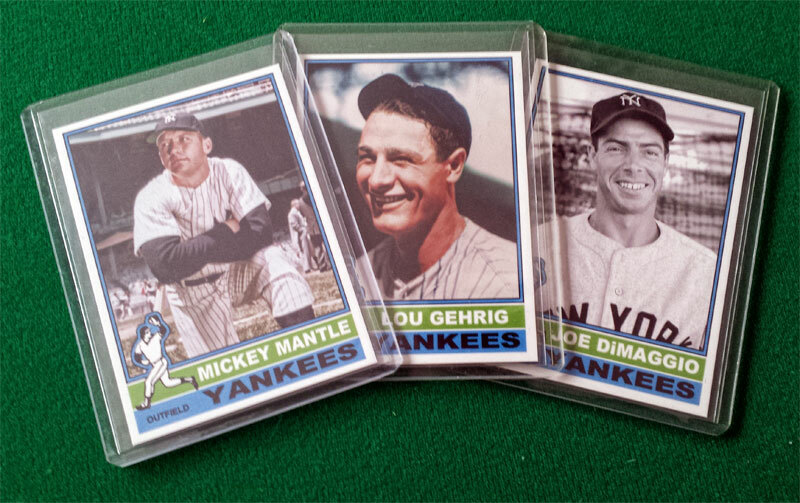 And just like that, junk wax cards are exciting & fun again. Sometimes, I feel like that kid who was searching for rocks in the stream in the mountains again. I had been looking at a particular Panini sticker card for a while that has the venezuelen stamp on the back. It is a mystery as to what they are and why they have the stamp. Was it some collector who did this, or was it Panini? The sticker is shrouded in mystery – even after my feeble attempts of researching. For me and my collection, the value is in the mystery and the potential back story. The more of the story I have, the more valuable it is to me. 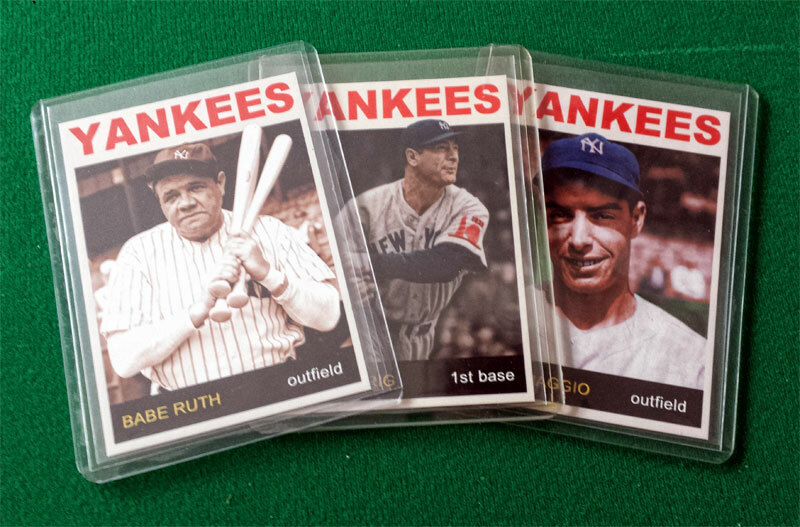 Even if it is some kid that stamped them on his own, there is still collectability for player collectors, somehow. A while back, I posed the question to the collecting community: “Do you collect known counterfeits?” The answer for many, was a resounding YES. No, I’m not talking about forged autographs or butchered patch cards. I’m talking about the well known counterfeits of yesteryear. The infamous Pete Rose rookie, the 1984 Donruss Mattingly, the 1986 Donruss Canseco (Beckett reads: BEWARE OF CANSECO COUNTERFEITS). 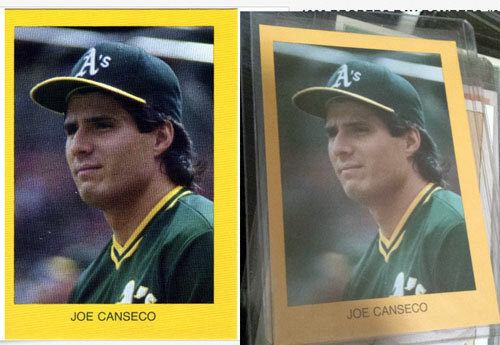 Which leads me to this request: If you have a counterfeit ’86 Donruss Canseco or 91 Desert Storm Canseco Call me. 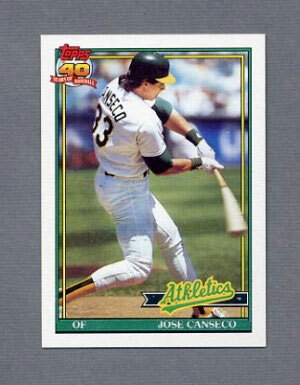 One of the let downs was an oddball card of “JOE” Canseco. This oddball (along with one other, I think) had card shops and collectors talking, because it was either an error, or they were trying to Americanize the Cuban slugger. I found one on ebay, and while I had it already, I noticed it had a much brighter border than mine. I took a picture of mine and compared it to the one for sale, then sent to the seller to ask if his truly represented the color on the screen. (His on the left, mine on the right). He said yes, so I took a chance. It came in yesterday aaaandddd….same border color :/ Oh well – I had to give it a try! Upon more investigation, here is the back story: His company made them for Leaf. The tooling was destroyed after they went bankrupt and these were used as early tests for the process. Only about 15 players in the set have these proofs made. 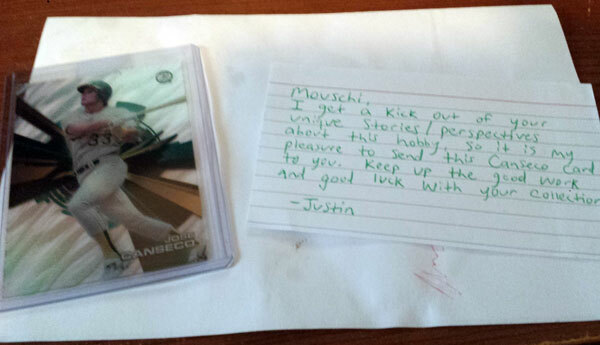 Thanks again Justin! That was incredibly nice of you. This doesn’t fit in with ANYTHING I’m saying, but I thought they were clever enough to whip up and post. 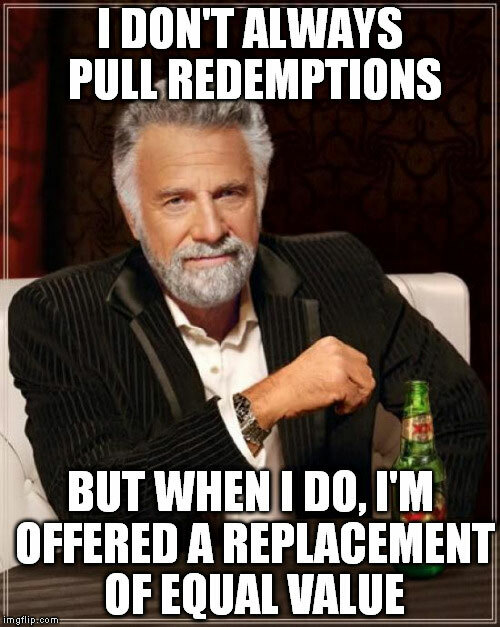 Does anyone else feel this way? Or perhaps more suitable …. Anyway, that about does it for this article. I hope to hear from you about your cool odd ball / variation / error finds. More importantly, I hope to hear about your Canseco stuff that I don’t have! Hi my name is Candice and I just wanted to drop you a quick note here. Your articles are very impressive! I have enjoyed reading them. 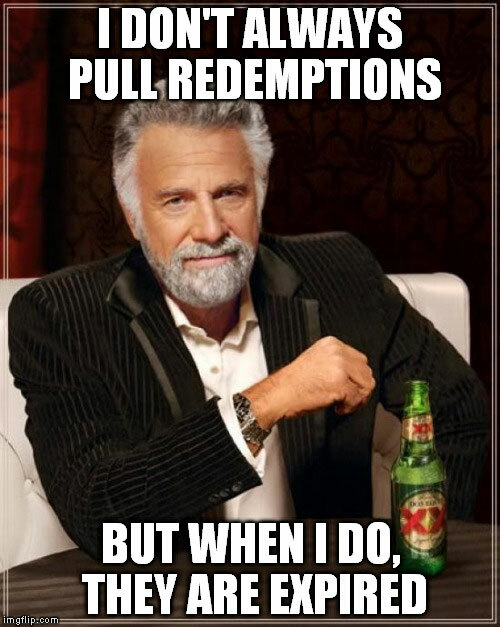 Please keep going with them, as I check your site often to see if you ever have new content. Keep it up, k?